It takes about forty gallons of maple sap to make one gallon of maple syrup. New England produces millions of gallons of maple syrup. I would venture to say that sugarhouses are still very much a family oriented business though many have shut down over the years in response to the stiff competition of big business. Some persevere even though it is no longer a profitable enterprise because that is what their families have always done. March is generally the time when sugarhouses are boiling sap and open to customers. I can’t recall being in any New England sugarhouse where you weren’t welcome to ask questions and watch the sap-to-maple syrup process. If you like maple syrup, do consider real maple syrup. If you’re in New England, please give the local syrup a try. 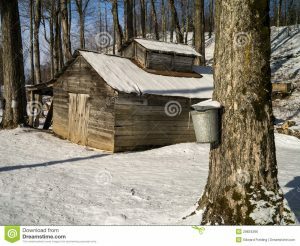 If you are traveling in New England in March, check out a maple sugar shack. If you live in New England, consider making your own. My brother taps his maple tree and generally gets a gallon of syrup each season. Click HERE for general information on maple sugar. Click HERE for a short list of New England sugarhouses.